Earlier this year i visited my sister and her husband who live in Leesburg Virginia in the United States. this is my choice of holiday each year, since they wed and she moved over there. to celebrate my visit it was decided that we should find the best restaurant around for a high quality celebratory meal. 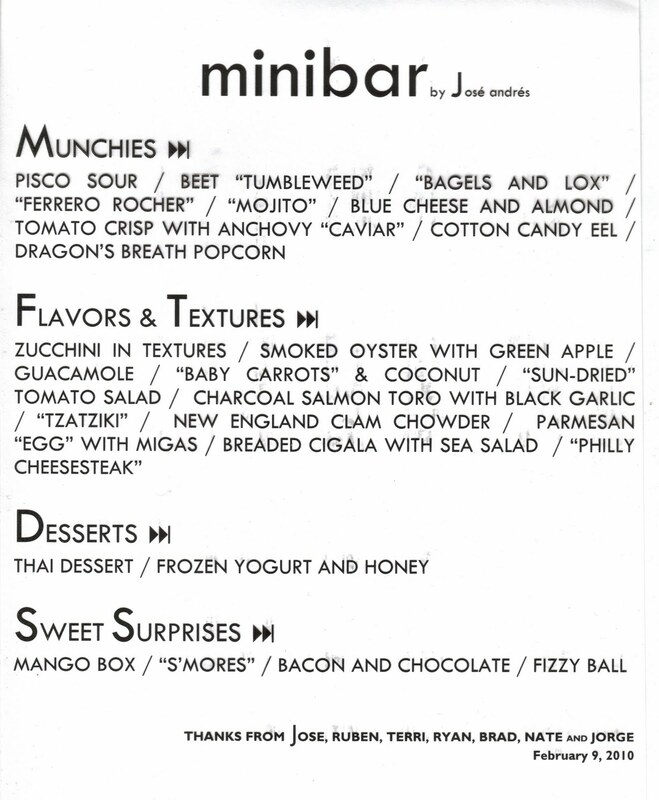 That meal was at minibar by Jose Andres at the cafe atlantico in DC. We had all read reviews and looked online to get a taster of what was to come,but nothing could prepare us for the meal we were to enjoy there. Starting with an aperitif of an Australian sparkling Shiraz in the bar downstairs, we patiently waited in anticipation of our twenty six (count em) courses of varying sizes-some a single bite,some two mouthfuls and a few were large enough to warrant cutlery-and each and every one was a well rehearsed, perfectly executed gem. One of the most interesting parts of the experience is that all six guests for each sitting are sat along a short bar (hence the name) directly facing the talented guys who were preparing and cooking the meal. our first 'course' was a pisco sour, which was presented hot and cold, with the first mouthful being col,but spiced by a few dashes of Tabasco, and as you drank through it the temperature rose, until the last mouthful which was hot. A clever and effective first step.from there we worked our way through a plethora of diverse yet somehow logical progression of dishes including- spherification of mojito flavours-mint,sugar,white rum,lime and even had the sparkle you get from the lemonade/tonic water from a traditional mojito-a savoury ferrero rocher, cotton candy (or candy floss) eel-two bites,two flavours, smoked oyster, 'guacamole'-which was a frozen tomato parfait wrapped in avocado topped with crisp onions,olive oil and micro coriander cress, and the most unique philly cheese steak you will ever come across- a puffed wafer filled with a cheddar cheese es puma or foam,topped with a lightly blow torched carpaccio of beef fillet smeared with a caramelised onion puree. all the flavours of the philly in a novel and imaginative presentation, all the way through to a selection of sweet courses including chocolate and bacon, and a crisp mango box filled with white chocolate mousse. Without a doubt, there are very few people cooking like this in America right now-Wylie Dufresne at wd50 and grant achatz of alinea are the only American chefs cooking this way to get any coverage here in the UK, and i feel privileged to have been to minibar and experienced what they are capable of. 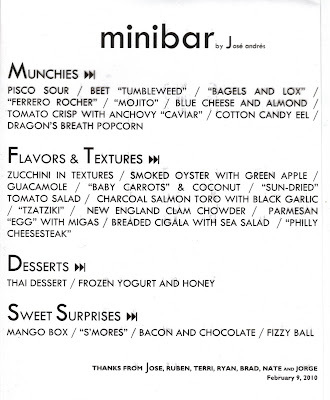 The next time i am going for a family reunion, i am going to make sure minibar is on my list of places to visit.